Take a look to see how another Egyptian—Tutankhamun—used linen clothing. Educators, scroll down for a quick list of key resources—including today’s MapMaker Interactive map and a 5,000-year-old sewing pattern. Only the top portion of the elaborately pleated Tarkhan dress survives. It’s more than 5,000 years old—how has your oldest piece of clothing held up? The Nat Geo News article reports on the remarkable age of the Tarkhan dress. Why does the garment have that name? The garment was excavated from the Tarkhan cemeteries, ancient burial grounds about 50 kilometers (31 miles) south of Cairo, Egypt. (Here’s a simple locator map.) A team led by British archaeologist W.M. Flinders Petrie unearthed the dress in 1912-1913, although it was not identified as anything other than “a great pile of linen cloth” until 1977. The garment’s date was only verified this year. What material did ancient Egyptian craftsmen use to create the dress? The Tarkhan dress is made of linen. Linen is light, thin, durable fabric made from fibers of the flax plant. The oldest linen fabrics (discovered in Georgia) were cultivated from wild flax about 34,000 years ago. Flax was domesticated by those resourceful Mesopotamians about 9,000 years ago. Linen remains an important textile today, used for clothing, as well as bedding, tablecloths, towels, and bags. 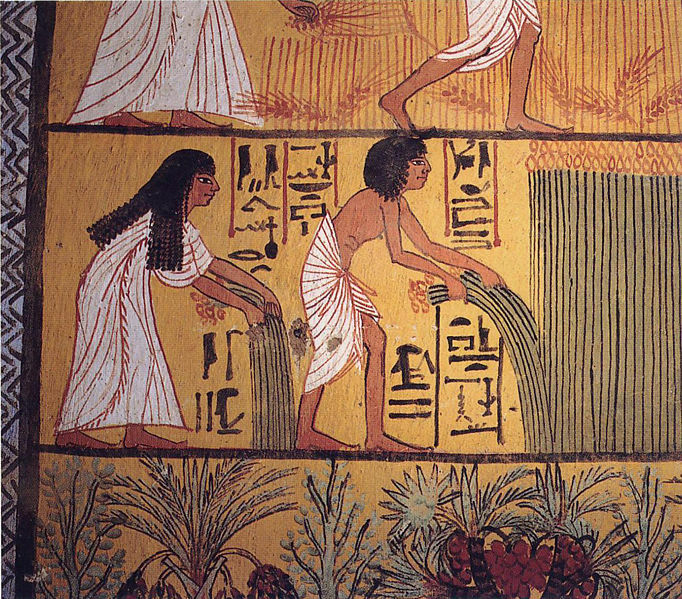 Was linen a rare commodity in ancient Egypt? 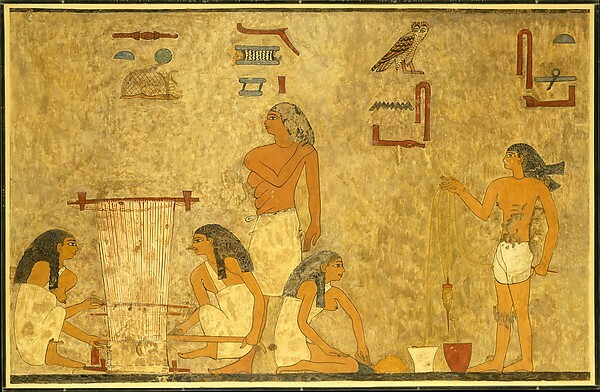 Ancient Egyptians used linen much the same way we do—for clothing, household use (such as pillows), industrial use (such as fishing nets and grain sacks), and trade. Ancient Egyptians had an additional use for linen that we do not employ today, however—funerary wrapping. Mummies were all wrapped in linen strips. Use today’s MapMaker Interactive timeline map to put the Tarkhan dress in historic perspective. If linen was so popular in ancient Egypt, what makes the Tarkhan dress so special? It’s 5,000 years old! Linen fabric is incredibly delicate and perishable. Most ancient Egyptian linens have simply disintegrated, and the pieces that remain are usually scraps of fabric, not intact items of clothing. The Nat Geo News article says the Tarkhan dress was an example of ancient couture clothing. How do we know this? According to the Petrie Museum, “[t]he Tarkhan Dress remains the earliest extant example of complex woven clothing—that is, a cut, fitted and tailored garment as opposed to one that was draped or wrapped.” What are other examples of ancient clothing? 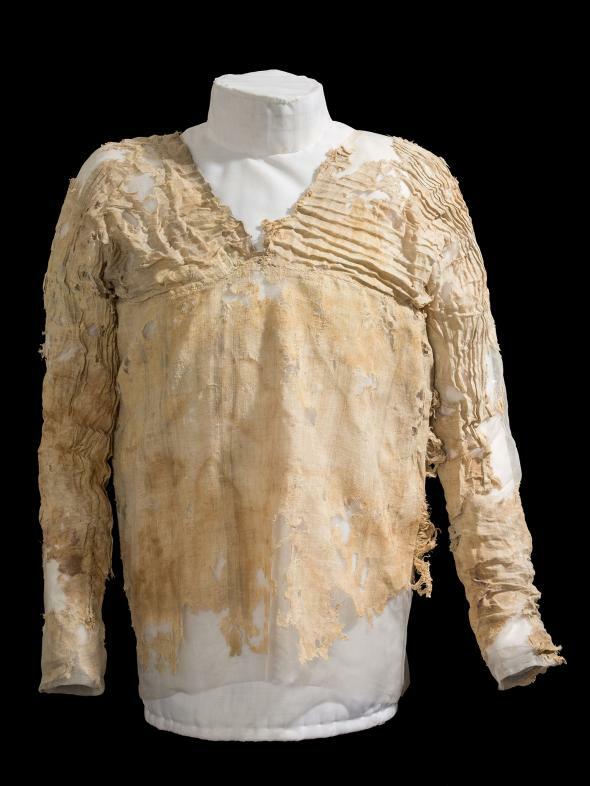 Americas: Fragments of cotton clothing from the Norte Chico civilization in Peru are the oldest known clothing in the Americas, dated to about 5,000 years ago. Asia: The earliest known pants were wool, fashionable, and worn by horsemen in western China about 3,000 years ago. White and golden or blue and black? Previous Previous post: Hiking Map for The Martian?